The Mazda2 is a fun small hatchback setting itself apart with its standards of comfort and interior refinement. It makes your day-to-day drive enjoyable and looks good while doing so! Notice that most of Mazda's ads do not include prices, they focus on long term benefits such as "low interest rates" and "unlimited KM warranty". Their recent model line-up includes features that are critically acclaimed such as a rear camera, a 7" screen, and a central control knob like those you see in luxury cars (Instead of focusing on a touch-screen while driving, you can perform all actions needed from the knob situated between the center armrest and the shift knob). Those features are standard on all Mazda cars. 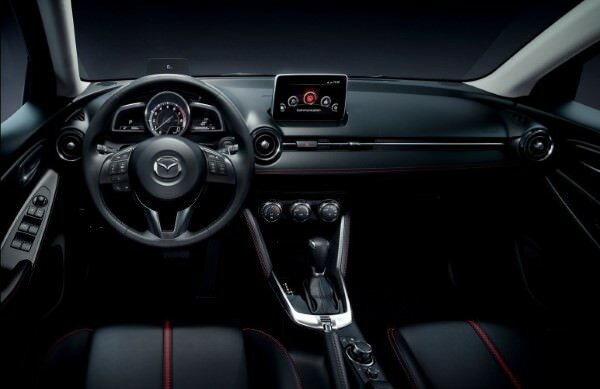 Another differentiator is the fun factor that you get from driving a Mazda. That is stated in most of the renowned worldwide car reference websites. And finally there's the design factor. People seem to love the design. For all these reasons, charging a premium price is considered more or less justified, especially that the year long offers make these prices more bearable. Do you agree?